Midland Burger Co. is one of 10 food trucks in the U.S. recently nominated for the title of 2017 Rookie Food Truck of the Year. Mobile Cuisine, an online resource for the mobile food industry, nominated food trucks from across the country after tallying more than 550 submissions. Other food trucks nominated ranged from Washington D.C. to Pittsburgh to Austin Texas. The winner will be chosen by an online poll on mobilecuisine.com that will close at 7:59 p.m. Dec. 22. Final results will be announced the following Monday, according to the website. Midland Burger Co. co-owners Ashley and Jim Welch began serving artisanal burgers, fries, poutine and aioli out of their food truck at the end of April 2017. The food truck quickly gained a strong local following for its local ingredients and creative recipes. After so much success after one summer of operation, the Welches have secured a permanent restaurant location to serve their burgers in downtown Midland. They will continue to serve food simultaneously out of the truck in addition to their new brick and mortar location that will be at 139 Ashman St. The Welches served food out of their truck almost daily this summer, and started operating about three times a week once the weather got colder, Ashley said. "It's been great, we sell out regularly," Ashley said. "We're booking up for the truck for next year already." The burger company posted on Facebook on Dec. 10 that "it's time to put the truck away" for the season after eight months of operation. Customers can look forward to their new restaurant opening soon, hopefully in the spring, the Welches said. "And remember, the truck will be back before you know it," reads Midland Burger Co.'s Facebook post. The Midland Burger Company food truck has amassed a local following for its burgers and fries, but has also secured a permanent restaurant it will soon operate out of downtown. Midland Burger Company co-owners Ashley and Jim Welch began serving artisanal burgers, fries, poutine and aioli out of their food truck at the end of April 2017. The local ingredients and creative recipes for their food became an overnight hit with Midlanders. They frequently sell out every time they "roll up" to a location, Ashley Welch said. Midland Burger Company will continue to serve out of the truck in addition to a brick and mortar location at 139 Ashman St. that they hope to open early next year, Jim Welch said, ideally by the end of January 2018. The space was formerly operated by GO! Salads restaurant, and is located next to Espresso Milano coffee shop. "At first we were actually opposed to a location," Ashley said. "We like the flexibility and going where people are instead of being stuck in one place, which is kind of why we're keeping the truck so we can still do all the events and things." The couple is confident with their growing customer base that they will have enough business to support a permanent location and still use their food truck. Having a "climate controlled" option is something they are both looking forward to offering customers. A permanent location will also allow them expand food options. • The "Merica" grass-fed beef patty burger with pickle, ketchup, mustard and an American slice. • A veggie burger that will vary depending on what is in season. • The Shroom & Swiss, which is a grass-fed beef patty with mushrooms, swiss cheese and garlic herb aioli. Other menu items will rotate, but they plan to offer two more "creative" burgers and another loaded fry. Customers in the new location will experience a fast-casual dining experience, Ashley said. People will be able to eat outside on picnic tables and they are looking into adding additional outdoor seating. It will have a "modern look," she explained. "It will be weird though," Jim added. "We like weird art, we want it to look funky." The couple liked the idea of being downtown, especially when the city is improving the area. "When we were looking around for a location we kind of knew we wanted to be downtown because of all they have going on down here right now to make Main (Street) better," Jim said. "We like being down here, when we're not working we like to come down here." They plan on bringing the food truck to summer events downtown, including Tunes by the Tridge. Midland Burger Company's Facebook page is updated regularly with a calendar showing where the truck is serving, as well as daily menus. Ashley quit her job in real estate job to work at the truck with her husband when they quickly realized the success of Midland Burger Company. What makes their food stand out is a dedication to buying local, quality products and offering creative dishes, the Welches said. Midland Burger Company burgers are made from grass-fed beef from JNelson Farms, a farm located about eight miles northwest of Midland. Other ingredients are also purchased in season and from local farmers markets. "We don't want you to be able to go to Gordons or Meijer and buy what we do and make it yourself at home," Jim said. The menu varies with what is in season, but usually a burger and fries cost $9 or $10. "We want it to be affordable," Ashley said. "We want people to be able to eat good food without breaking the bank." Truffle duxelles, pickled carrots, marinated cabbage — that’s right, a burger-serving food truck is coming to town. Chef Jim Welch and his wife, Ashley, are crafting plans for Midland Burger Co. They plan to set up in late March or April at the Farmers Market and in the downtown area, and possibly at Midland High School during lunch. “We’re willing to be where people are interested in having us,” Ashley said. The 7-ounce burgers come with a side of hand-cut French fries. The duo says the burgers are made with meat ground daily. They plan to always have a vegetarian and basic American burger, while rotating three to four other creations and featuring one every week. They’re working with different farms and vendors in the area to locally source toppings as often as possible. The buns, with a gluten-free option, are sourced from a local bakery, Ashley said. The food truck also plans to serve four varieties of poutine, a popular Canadian comfort dish typically consisting of French fries, cheese curds and gravy. Two already on the menu are: “Brisket Poutine”: red-eye gravy, cheddar curds ($6); and “Bahn Mi Poutine”: pickled carrot, radish, jalapeno, sriracha ($6). “We’re trying to bring things we know we enjoy,” Ashley said. Another rarity on the menu: Faygo. The Welches plan to serve the Michigan brand’s “Rock & Rye,” “Moon Mist” and its diet counterpart, along with orange, cream soda and regular and diet colas. There are also two salad items on the initial menu, including the “Buckwheat,” which blends a spring mix with apple, avocado, sweet lemon vinaigrette, pepitas and dried Michigan cherries. A morning menu is planned for early birds at the Farmers Market, including breakfast sandwiches, fruit cups and yogurt. At the business website — www.MidlandBurgerCompany.com — patrons will have the option to order and pay online. The Welches plan to start Midland Burger Co. on their own, with Jim handling the grill and Ashley handling customer service. While writing the business plan, Ashley said they did a lot of research on food trucks. She said they’d like to serve 100 burgers a day at the start. He decided he wanted to do his own thing, and a food truck “would probably be the easiest way to start out,” due to low overhead and a flexible location, Ashley said. Jim said he is excited to bring fresh, local options to people. From the look of the new Midland Burger Co. menu, Welch is still a kid in the sandbox on a summer afternoon. Jim, 36, and Ashley, 33, a Realtor, live in Midland with 4-year-old and 8-year-old sons. Visit www.MidlandBurgerCompany.com for more information. Our number one pick for Michigan's Best French fries is Midland Burger Company, a local food truck that changes locations every day, taking their incredible fries with them from place to place. The Michigan's Best team of Amy Sherman and John Gonzalez traveled over 3500 miles during our search for fantastic fries in Michigan. We were not disappointed. We got to try incredible fries at every type of place imaginable. We visited fast food-style joints, walk-up windows, strip malls, white tablecloth, breweries, institutions that have been around for years and places that have only been open a few months. We even had fries from a food truck. And we couldn't believe how awesome these fries are. Not only has Midland Burger Company only been open for two months, they are making their award winning fries out of a TRUCK. The fries that stuck out were the ones that were hand cut, in house. While purchased, frozen fries can be incredibly tasty, and certainly might be the only option for some places due to size, storage and labor, we wanted to celebrate the chefs and restaurants who are making the effort to go all in with their fries, like Midland Burger Company is every day. These are places that have worked out their methods through test after test. 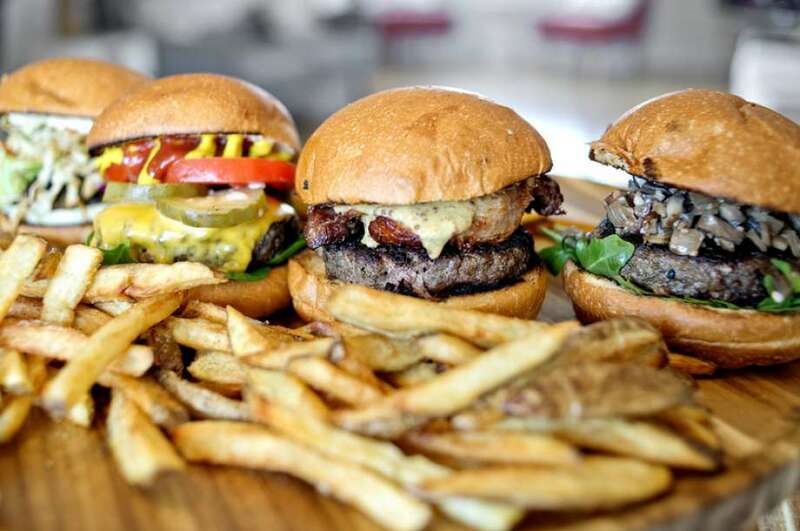 Midland Burger Company tested recipes for months before they opened. They offer hand cut products, that go through a multi-step cooking process, fried fresh every day, for the very best results. This is not easy, fast or always cost efficient. But that attention to detail does create the very best fries to enjoy in Michigan. When a place renames itself “Midland Fry Company” every Friday, because they only serve fries all day, you know they take their French fries seriously. Owners Jim and Ashley Welch just opened their mobile food truck two months ago, and they’ve been having a great season so far. They move around the Midland region on a regular schedule (check out their Facebook page to see where they are), offering both burgers, fries, loaded fries, as well as homemade dips and sauces. The fries here are practically perfect in every way, with lovely caramelization, excellent crispiness and a secret house seasoning. Great on their own or with one of the truck-made dips, such as balsamic ketchup, garlic aioli, or a kicking pineapple Caribbean ketchup. Or get them loaded and bring a friend to share these huge baskets of goodness. Midland Burger Company has only been open for two months.. Owner/Chef Jim Welch previously worked at Whine in Midland. His wife, Ashley, still works as a real estate agent when she's not running the front of the truck. This is a labor of love, and both Jim and Ashley love it. We absolutely loved MBC, and their fresh, delicious fries. Perfect on their own, they are only enhanced with all of the incredible toppings they serve. Even thought they have only been open for a few months, the quality and consistency at Midland Burger Company make them Michigan's Best French Fry. Yes, we ate a lot of fries on our search for Michigan's Best French fries. And while we loved them plain, we especially loved some of the creative toppings we saw being put to use on top of fantastic fries. One of the dishes that is on the rise in Michigan is the Canadian favorite, poutine. Poutine originated in the Quebec region of Canada, but is now almost considered their national dish. Since we share 721 miles of border with our friends to the North, it was just a matter of time before poutine's popularity caught on here in Michigan. Traditionally, poutine consists of French fries, cheese curds, and a light brown gravy. 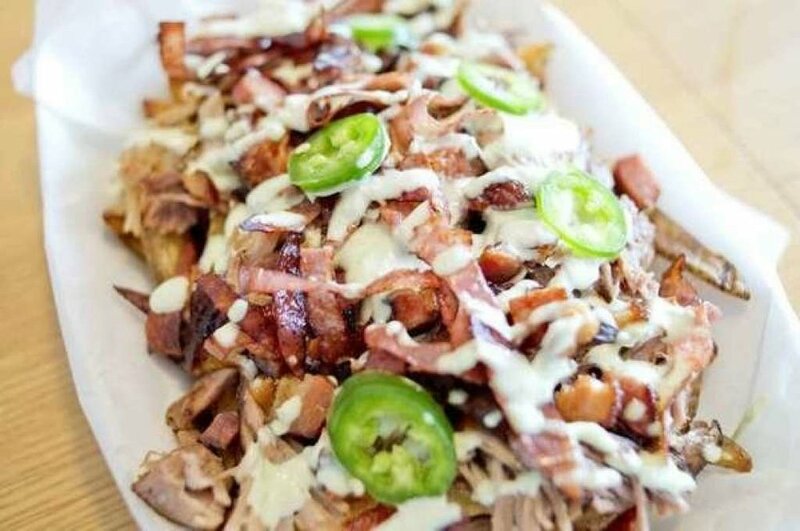 We came across this version, but also several others that were enhanced with everything from pulled pork, brisket, fried cheese curds, and even pierogies. If you haven't had poutine yet, get out for a visit and a taste soon. It's a rib sticking meal, full of flavor, that is pretty fantastic. Give a salute to our neighbors to the North for coming up with this awesomeness, once tasted, poutine creates quite a craving. Our pick for Michigan's Best French fries, Midland Burger Company is the first food truck to be a winner. We loved everything about their fries here. Hand cut, soaked, double fried, then with just the right amount of secret homemade fry seasoning, these are the perfect fries. We were totally in love the minute we tried them. Then we tried their brisket poutine and fell in love all over again. Brisket braised in a red wine gravy, for a richness that can't compare, and cheese curds so fresh they squeak on top. Incredible flavor, huge portion, and only $9.